For the first two and a half years of our son Atticus’ life, we were fortunate enough to have family members close by for babysitting. From nearly day one of his life at home with his father and I, my mom (our son’s Nana) was there to help. I was home for maternity leave from my job (unpaid of course), with my mom at my side to help on the days when Atticus’ father was working. I was also fortunate enough to have a work from home position; therefore a segue back to working life was comparatively simple. He gurgled and cooed next to me on the floor, I was able to stop working and nurse when I needed to, and he napped nearby, next to the room where I worked in our tiny apartment. Nana was there on some days for extra help, and he napped in her arms on countless occasions. As I was an older first-time mother, having Atticus at 40, my own mom was much older than some grandparents. My mom also came with a litany of lifelong medical issues which, around the middle of Atticus’ second year, started to become worrisome. While she was able to find a medical management solution, we were left with a challenge: find daycare, find it quickly, and find something that not only adhered to our ideals as parents but was a facility in which we could afford the care. The challenge seemed insurmountable. How do people do this? How do people arbitrarily choose strangers to watch their children?! I immediately got to work, with the three-month deadline kindly handed to us by his Nana and Papa. As a mom in my 40s, I feel my approach to parenting was vastly different than it would have been had I been a first-time mom at any other age in my life. Because of this, my view on parenting and how to “mother” was bolstered by my passionate desire for learning. Everything about being a mom became something I could learn about, including finding a preschool. I utilized ALL of my resources: friends who were parents years ago, friends who were also first time parents at later ages, local parenting groups, and, even less so, some online research. I didn’t always agree with what I was told, or information given to me, but I took it all in, and with my partner, Anson, we decided what was best for our son. The facility matched our parenting/socializing style but was far beyond our budget. As our child was still in diapers, clearly this was something that wouldn’t work for our family. I panicked. What now? This need for a vast pool of resources brought me to the Step Up to Quality program. A friend suggested looking through the Step Up to Quality program list to give me an idea of what types of state licensed facilities were in my area, and how they were rated on a number of factors. We found three facilities on the list that met our criteria and made inquiry calls and scheduled visits with all three of them. One was a large child care center, one was an in home daycare licensed for up to 12 children at a time, and the final one was a facility called Imagination Station, of which there are four locations in Omaha. The two facilities that lost our vote were not for lack of quality, but for simply not being a match for our family. Then our visit to Imagination Station happened. Immediately our son ran into a preschool classroom and started playing in the middle of a small group of children around his age. Naturally the children sat there mildly confused at this sudden addition to their routine, but the teachers in the room explained that Atticus was a visitor for the day. The children quickly relaxed and started sharing toys with our son as if he had been there for months already. They pulled him in one direction to show him this or that, and ran excitedly with him in the yard while Anson and I asked a slew of questions to a few of the teachers that were outside. In the end, I realized my logic and research landed us with Imagination Station, as they were willing to work with a not-yet-toilet-trained toddler in a preschool room, and the drop-off and pick-up times were ideal and generous. It was in our budget and allowed us to start him at a part-time attendance (which I found a rarity among other facilities). His vegetarian diet wasn’t even an issue as meals could be accommodated for children with special diets and allergies. Yes, all the criteria were there, but in the end it was where I saw my son light up the most, where I felt he would fit in, and where I felt safe leaving him during the day while I worked. Decide what is important to you. You may want to even prioritize these things in order of importance. Do your research. Check with your friends, read online reviews and reference the Step Up to Quality list. Visit a few facilities. Don’t visit just one – you’ll get a better feeling if you visit several and have them to compare and contrast with the others. Watch your toddler. What is their reaction to the center? No one knows your child better than you, so you’ll know if they feel comfortable there or not. This is one advantage you have over parents of babies trying to find child care. Listen to your gut. You’ll just know. You’ll combine your research with your observations of your child with your own feelings about the child care program, and you’ll come to the right decision for you and your family. Did you find child care using Step Up to Quality? Email us at nde.stepuptoquality@nebraska.gov and we’ll be in touch. We might not be able to use every story but we’d love to hear from you! Coaches are universally valuable people to have in your corner – they help unlock potential, they help you learn new skills, and they can encourage you to accomplish goals you never before thought possible. For those child care directors or owners who are going through the Step Up to Quality program, a free coach is a big asset to participating. Programs are eligible for coaching once they have achieved Step Two. The coaches help providers navigate through the process, and ultimately improve educational experiences for children. Aiesha Rahn is one of the original Step Up to Quality coaches in Nebraska, and currently is guiding six programs through the five-step process. She’s spent her whole career in various aspects of teaching and early childhood development, and has earned her master’s and EdS in the field, too. She credits her mom with being her coaching inspiration. “My mom poured so much into me, so I could be that little light for others,” she said. Helping teachers learn has been her calling – she’s also an adjunct instructor at Metropolitan Community College. Child care directors are the ones driving the bus, Aiesha said. She works with people like Jill Garrett, Early Childhood Site Director at Kids Can Community Center in Omaha, meeting with them once or twice a month for a few hours at a time to help them navigate the process. When Kids Can was last rated, the program came in at a Step Four. Almost two years have passed, and the program is about to submit the paperwork to be rated again. In that time, Aiesha and Jill have worked from the same Action Plan, which is continuously updated and tracks the progress and achievements attained. For example, half of Jill’s staff has earned their Child Development Associate designation, which is a remarkable accomplishment. “The Action Plan is the heartbeat of what we do for Step Up to Quality,” Aiesha said. For Jill, a seasoned early childhood education professional, the role of a coach at her center is to encourage and inspire. At the same time, Aiesha is humble enough to know that she doesn’t have all the answers. Regardless of a center’s overall rating, the journey to improving quality is on-going. Jill openly recognizes there are always tweaks and enhancements to be made to increase quality in the care provided. One of the tools Jill uses for continuous improvement is a biannual parent survey, which they recently administered. More than half of their parents responded, and overall the satisfaction with Kids Can was very high. However, part of the Step Up to Quality process includes Improvement Plans, which focuses on continued growth in all aspects of the center. Jill’s Improvement Plan centers around communication with parents regarding learning opportunities. For example, the center’s teachers celebrated Las Posadas in December with a piñata for the children to break open. On its surface, it may just look like a party. But the children were learning social and emotional skills – they were waiting for their turn, cheering each other on, and learning about a historic and cultural event. The Improvement Plan encourages the teachers to communicate those skill building opportunities they have with the children throughout the day to their parents. Jill and her team have implemented significant curriculum upgrades and professional development programs, among many other changes, as a result of participating in Step Up to Quality. With the support and encouragement from Aiesha, who is just a phone call or text away at all times, Jill continues to push her team to move forward every day for the children at Kids Can. When The Valley Child Development Center opened in January 2018, it was the culmination of years of work residents of the town had poured into their dream. Their dream wasn’t and isn’t just about a quality child care center in their town, though. It’s about making Red Cloud a vibrant, viable community for generations to come – and quality, affordable child care was a key missing ingredient. In 2012, the Red Cloud Community Foundation Fund, with the support of the Nebraska Community Foundation, organized Community Action Planning. It was comprised of a series of meetings with all interested members of the community and the need for child care ended up being one of the top two priorities identified. At the time, just one licensed in-home child care was available within a 20-mile radius of the town. A committee was formed, and it was decided that they would “dream big.” The city donated land, and funds started to be raised for a best-in-class child development center. By June 2017, the building was being built and the director, Kerra Robinson, was hired. She had extensive experience in the education field – but had never run a business before. She hit the ground running: hiring staff, creating procedures, purchasing furniture and meeting with families. “One of the first things I did after I was hired was enroll our program in Step Up to Quality,” she said. Kerra took the community’s dream of having a high-quality child care center and adopted it as her own – taking the vision to the next level. Aligning her program with Step Up to Quality principles and guidelines helped her establish the culture of high-quality from the very beginning. Kerra and her team have built the center into one that would be highly sought after in bigger towns. Even though she doesn’t have much competition to worry about, she sets the standard high, so the kids in her care have the best possible start in life. 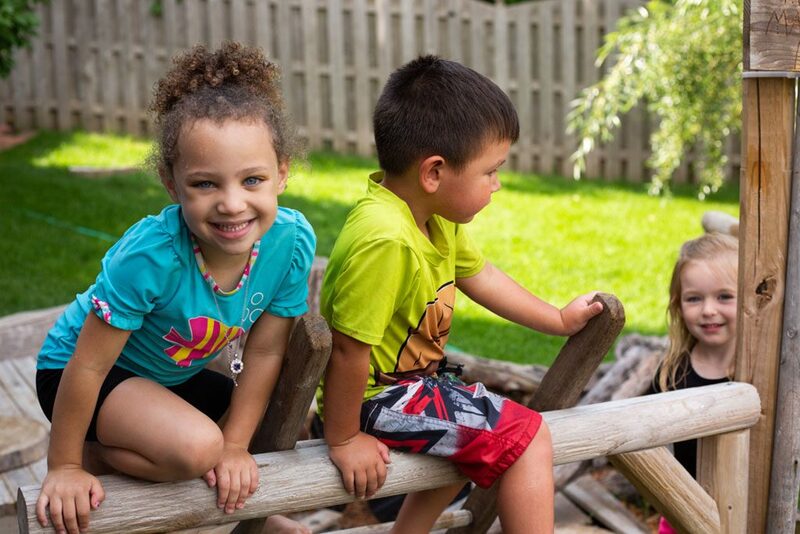 The Valley Child Development Center is licensed for 80 children from ages six weeks to 12 years old. They haven’t even celebrated their first anniversary yet, and they have 70 kids enrolled – and have already expanded their center’s infant care offerings from one room to two. Quite literally, Kerra and her team are just getting started. One of her goals is to increase the center’s Step Up to Quality rating this upcoming year. The town of Red Cloud has already seen their investments in high-quality early childhood care and education pay off. They’re getting attention from across the state from other towns that want to replicate the results they’ve seen. For example, the town’s only locally-owned grocery store was in danger of closing. Like child care, having a convenient place to buy groceries is key to retaining families in small towns. A woman who grew up in Red Cloud, but lived in Seward, always thought about moving her family back there. She and her husband happened to be in town for her ten-year high school reunion one summer, and she heard about the store’s plight. She also heard about the brand new child development center opening up – a perfect place to send their three young girls. Fast forward to today, the grocery store is thriving under the new ownership, and so are their three girls who attend The Valley Child Development Center. Kerra could go on and on about these sorts of stories. There’s the single mom who can now attend nursing school because The Valley Child Development Center accepts child care subsidies (the only center to do so in the area). There’s the high school student who volunteered at the center and is now taking education courses in college. She worked there over the summer and has a place of employment if she chooses to come back to her hometown after college. “Mostly I think about the really young kids that we’re nurturing right now, and how we’re preparing them for kindergarten, and how they will be ready to learn,” she said. Those children soon turn into high school students, who turn into people who might want to stay in the thriving town of Red Cloud. When Adam Feser promotes policies affecting early childhood in Nebraska, he can reference countless research studies, stacks of data analysis and endless quotes from experts. But maybe the most meaningful example of the power of quality early childhood education is his own family. Adam works as a policy associate for First Five Nebraska, an organization focused on changing public policy and public opinion related to the importance of quality early childhood care. He and his wife Amanda are also the parents to three boys, ages 5, almost 3, and 4 months. “I’m always reading up on early childhood education issues and trends, and it’s always like reading about my own family. It’s pretty cool to have my career and family life relate to each other that way,” he said. He especially saw the importance of quality child care play out in his oldest son, who is in kindergarten this year. Teddy attended UNL’s Children’s Center ever since he was 18 months old. Within a span of two weeks, Teddy graduated to kindergarten and his youngest brother Louis started at the center, joining middle brother Franklin. Leading up to the first day of school, Adam tried to teach him the importance of paying attention in class by doing the “ears listening, eyes watching, lips closed, hands still, feet quiet” exercise. When Adam and Amanda were choosing child care centers back when Teddy was a small toddler, they didn’t know about Step Up to Quality. “It would have helped us tremendously, but luckily we found a great program anyway. Regardless, it’s validating that they’re in the program and at a Step 5,” Adam said. Step Up to Quality is a collaborative program from the Nebraska Department of Education and Department of Health and Human Services for early childhood education centers and in-home child care providers to go above and beyond the basic licensing requirements and illustrate their commitment to quality education for the children in their care. Providers go through a 5-step process – but it’s not a ranking. All participating programs are committed to quality, regardless of the step they have achieved. Nebraskans are known for being hard-working people, and the statistics back this up. In 2016, nearly 78 percent of children in our state had all available parents in the workforce. The national average is 61.9 percent. This means a lot of kids in our state are enrolled in child care, both in centers and in homes. Quality early childhood education is paramount for the future of Nebraska. After Suzanne Schneider’s first son started attending child care, it dawned on her that she might like working there. She had a degree in education, and, it turned out, an undiscovered passion for teaching little ones. She quickly became the center’s director. As she worked in the field longer, Suzanne discovered another passion: developing the teachers. “Transforming and molding teachers, and helping them grow, ends up impacting the kids. I find that incredibly rewarding,” she said. As the Director of Westminster Preschool in Lincoln since January 2010, Suzanne has used accreditation and rating programs like Step Up to Quality to not only improve the child development resources of the school but also to help the teachers grow professionally. “We invest in quality initiatives, and it makes a big difference for everyone,” she said. When Westminster Preschool initially enrolled in the Step Up to Quality program, they were rated a Step 3. Suzanne’s team worked through the process and made improvements, like updating their curriculum. They made it to the top, a Step 5, the first center to make it to that level in Nebraska. “Our Step Up to Quality coach was great about understanding who I was and what our program needed. She helped us see areas where we could grow, and find really good staff trainings for us,” Suzanne said. More than 8,500 people work in child care in Nebraska. And, the state has the highest concentration of child care workers per 1,000 people employed in the entire country. Westminster Preschool devotes a lot of resources to teacher training and development, even though Suzanne is well aware of the high turnover rate in the industry (the average turnover rate at child care facilities is 30 percent). Jen Nelson has a message for parents looking for child care: it’s OK to be a snob. It’s OK to expect more out of your current provider, too. As the sole proprietor of Nurture and Nature Family Child Care, Step Up to Quality’s first rated child care provider, and the first in-home program to make it to Step 5, Jen practices what she preaches. She expects more out of herself every day. Even though on paper it might sound like Jen breezed her way up the Step Up to Quality ladder, achieving all five steps in six months, it was a challenge. At first Jen thought Step Up to Quality might be more geared toward child care centers and not in-home care. But she worked with her Step Up to Quality coach to personalize the journey to the Step 5 rating, including using the observation tool that is specific to family child care homes. “When I set my mind to something, I find a way to get it,” Jen said. In the last few years, Jen has made lots of little changes. She started parent/teacher conferences. She has a monthly rotation schedule for her wall displays. She put up pictures of what vegetable or fruit will come out of the plants in their garden – and also has the name listed in English and Spanish. These little changes have added up to a lot. She makes the smallest of moments into tiny lessons. If the kids are having crackers for a snack, she might talk about the rectangular shape, or she might make it into a subtraction lesson as the kids eat. “That’s what I’m most proud of, those little things. Especially when one of the kids says, ‘I’m sorry,’ or ‘do you need help.’ When one kid comforts another, it warms my heart. It makes me want to learn more and more,” she said. Even after being a child care provider for 33 years, Jen still has the energy, the motivation and the thirst for knowledge to continually improve. Because she is the only teacher at her in-home center, looking after as many as eight kids, she uses nap time (and some evenings) to study and network online with fellow child care providers to be better every day. After her Step Up to Quality work was finished, she decided to get her associate’s degree. She graduates this fall. “I was able to do my practicums and observations here, and it ended up being great for the kids, too, to incorporate that into their lessons,” Jen said. She tries to travel to conferences and meetings to learn from others all across the region and nation. She plans on diving into a bachelor’s degree program next year, too. And she has no plans of stopping anytime soon. Jen and her husband have five children, and seven grandchildren, all of whom live in the Omaha area. I’m a mom of two biological kids, but in my heart, I feel like I have hundreds. Fellow child care teachers and facility owners can back me up. It’s not just a job to us. I would do anything for these kiddos, just like I would my own. My center, Bright Beginnings, is open from 6 in the morning to 6 at night. Some of the kids are with me for ten or 11 hours a day. We are licensed for 41 kids, so since we opened in 2009, many families have come through our doors. It’s a privilege I don’t take lightly. Just like being a mom, our job doesn’t stop in the evening after we’ve cleaned, sanitized and put everything away. We have been working on counting with her daughter, and we love every minute of it. I texted her back and said she made my whole Sunday. I wish parents knew how much of an impact their kids have on us. How their smiles make us smile. How their squeals delight us, and their hugs fill us up. How we live for seeing those light bulb moments of growth and hitting those milestones. Another mom recently sent me a photo of her son hitting his first triple in a baseball game. He was the very first infant we cared for. My office walls are covered with photos of my kids, including him. They mean the world to me. I was originally going to be the cook at Bright Beginnings when it opened, but I had a lot of experience with kids and I quickly became its director. Lisa, our curriculum director, and I have been leading the center ever since, and we often talk about how we want to raise the bar on child care, because we believe that our kiddos deserve the best. Once I heard about Step Up to Quality, we decided to go for it. I describe Step Up to Quality as a system that helps the best child care facilities become better. I almost think it should be mandatory. It’s worth it for our kids. For Bright Beginnings, it was a no-brainer to decide to participate. It was a bit overwhelming at first, and it was a lot of work. We had a few bumps in the road but we took our time with it and worked at our pace. Step Up to Quality helped us focus on the level of education we were offering, and it helped us improve our environment rating scale measurements (ITERS and ECERS). We had a great foundation to start from, and the key for us was our staff. My team is the absolute best and their commitment to our kids made it easy for us to improve on these items. When you enroll in Step Up to Quality, you are almost automatically at a Step 2 (out of five) once you complete the paperwork, set up process and initial training. Where it gets real is the observation and visit from a Step Up to Quality staff member – that’s when you can graduate up to a Step 3. You can imagine how emotional I was when after all our hard work, we actually moved up two steps to a four! It was incredible news, and even better things started happening for us. We were profiled in the Fremont newspaper. We were featured in the Rooted in Relationships video for the Fremont Family Coalition. I started getting more calls from new parents about our program. We have a waiting list of families. And, much better candidates for jobs were coming in to interview. Most importantly, I believe our kiddos know the depth of our love for them. We will never stop improving for them. We are already preparing for our Step 5 rating, I’ve been going back to school, and we are constantly taking classes and reading new methods on early childhood education. We want to show our kids that even big people are always learning, and hopefully that inspires them to be lifelong learners, too.